At Camp Jorn, campers will participate in 4 instructional classes per day. Other times are dedicated to cabin activities. The cabin group participates in activities such as trail rides, tubing, sailing, cabin challenges, sports and more. Evenings are a blast! We have all-camp activities such as campfires, skits, games such as Wells Fargo (think Capture the Flag), Granny’s Candy, Gold Rush and more. On closing night we have our Friendship Fire ceremony. Every camper will have the opportunity to purchase items from our trading post. Trading post carries items such as t-shirts, sweatshirts, blankets, water bottles, stickers, and much more. All trading post purchases are made through an online account set up prior to their arrival at camp. Campers are instructed in marksmanship with a focus on personal discipline which is required for safe and accurate shooting. Campers learn safety, positioning and proper shooting techniques. Archery is one of our most popular activities. Campers are taught by certified instructors. What a thrill to be able to shoot a bullseye using a bow and arrow. J-stroke, C-stroke or Draw? Campers will learn basic parts of the canoe, strokes, boarding and debarking, maneuvering techniques and safety procedures. Join us on a journey of creativity. Talented instructors help guide campers in completion of quality projects like Tie Dye, Beaded Jewelry, Lanyards, Candles and much more! Campers learn basic equine care and grooming as well as riding techniques. Techniques include mount/dismount, tack overview, riding posture, physical and verbal aides, and more. Jorn uses western riding. Campers sail Sunfish sailboats and learn tacking, gibing, proper body position, how to read the wind etc. Plenty of space on Rest Lake to sail! Campers must be intermediate swimmers. Campers receive instruction from the beginner level right through advance skills. Professional equipment including a boom bar is used to ensure success. 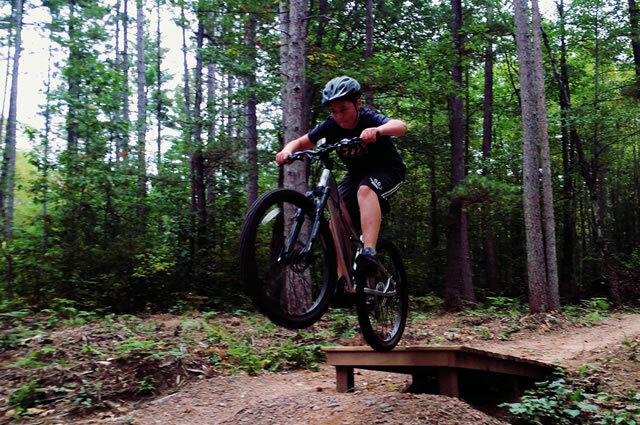 Test yourself on our new skills park or explore the many trails in our area while improving your mountain biking skills. Enjoy the refreshing feel of clean and cool water on a nice warm day, under the watchful eye of instructors and lifeguards. Master a skill, perfect a shot. Learn to work together in soccer, ultimate frisbee, basketball and other team sports.